It is the Feast of the Sacred Heart of Jesus. As a Catholic, you’ve seen the image of Jesus depicted in many ways–kneeling in prayer, surrounded by children, as a child in the arms of St. Anthony, and dying on the cross. 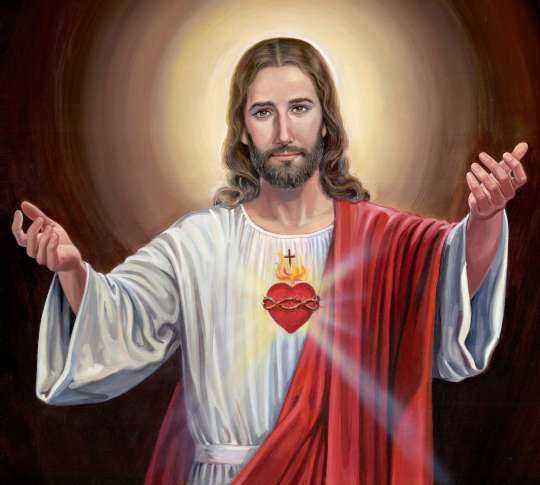 One of the most recognizable images is the image of the Sacred Heart of Jesus. It’s the image of Jesus with His heart exposed, surrounded by thorns, with flames and a cross emerging from the top. This image of Jesus is striking and powerful. In honor of the Feast of the Sacred Heart of Jesus, let’s take a look at the meaning of this image. What does it symbolize? Why do we celebrate the Feast of the Sacred Heart of Jesus? Also, who was Margaret Mary Alacoque and what was her connection to the Sacred Heart of Jesus? The sacred heart of Jesus Christ is a symbol that entered the world through the mystical experiences of several Roman Catholic nuns to whom the pierced Heart of the Savior appeared in visions. Yet it was Saint Mary Alocoque who perceived, through many supernatural visions of Christ’s passion, the symbol of the inflamed pierced heart, encircled with thorns. This vision is known as the “great apparition”, which occurred during the octave of Corpus Christi, in June of 1675. In this vision Jesus entrusted Saint Mary with the mission of propagating the new devotion. Jesus continued to appear to Margaret Mary and made revelations to her until 1675. It wasn’t until 1856, that Pope Pius IX decreed that the feast should be regularly celebrated throughout the world. What Does the Sacred Heart Symbolize? Catholics (and people in general) are visual people. Jesus knows this about us that’s why in addition to using parables to give us messages, He uses images to convey His messages. Seeing an image of the Heart of Jesus with thorns and the cross and flames certainly grabs our attention and speaks to us. He is saying, look at My Heart and see what I am feeling. The thorns around His heart are a representation of our sins and how our sinning pierces His heart. The flames and the cross serve as a reminder of the suffering He endured for our salvation and of His burning love for us. The dripping blood represents the blood Jesus shed for our salvation. That’s a pretty powerful message! But let’s explore this image in depth, to understand it fully. The Sacred Heart is often depicted in Christian art as a flaming heart shining with divine light, pierced by the lance-wound, encircled by the crown of thorns, surmounted by a cross, and bleeding. Sometimes the image is shown shining within the bosom of Christ with his wounded hands pointing at the heart. Heart: The heart is the center of being, both physical and spiritual. The heart represents compassion, understanding, love and charity. It also represents the temple of God, His Divine Center and dwelling place. The heart is the spiritual center of a being. The pierced and bleeding heart alludes to the manner of Jesus’ death and reveals to us Christ’s goodness and charity through his wounds and ultimate sacrifice. Crown of thorns: A crown is a symbol that represents sovereignty, victory, honor, dignity, reward, the highest attainment, dedication, completeness, the circle of time, of continuity and endless duration. For Christians it is also a symbol of the righteous, blessing and favor, and victory over death. Yet the crown that was placed on Christ’s head was made of thorns to deliberately parody the crown of roses worn by the Roman Emperor. The crown of thorns has thus become the symbol of the Passion and martyrdom of Jesus Christ. Cross: In Christianity the cross is a symbol of salvation through Christ’s sacrifice. It is redemption, atonement, suffering and a symbol of faith. Flames or Fire: Transformation, purification, renewal of life, power, strength, energy. Fire facilitates change or passage from one state to the other. Fire manifested as flame symbolizes spiritual power and forces. Fire and flame both represent truth and knowledge as consumers of lies, ignorance, illusion and death. Light: Light is a symbol of life, truth, illumination and a source of goodness. Radiance emitted by light symbolizes new life from divinity and the power of dispelling evil and the forces of darkness. It also embodies the aspects splendor, glory and joy. When illustrated the straight line usually represents light and the undulating line is symbolically heat; light and heat are symbolically complementary and polarize the element of fire. The sacred heart is a symbol of great self sacrifice and unconditional divine love for all beings captured in the actions and deeds of Jesus Christ. When our love and compassion overcomes and sacrifices our own ego, our spirit will be liberated and transform our entire being into a holy one. If we align ourselves with meaning of the Sacred Heart and the liberating vibration of Christ consciousness, this great symbol can become a gateway for us to change the world through our expression of unequivocal, genuine love. So let us love one another unconditionally. As my Father has loved Me, so have I loved you.